Moss and other accent plants for bonsai? Internet Bonsai Club :: IBC Forum :: Display - Tables, Kusamono, Accent Plantings, Scrolls etc. I've read everything I can get my hands on concerning bonsai, but have not come across much in books in the way of good plants to use for accent within the bonsai pot. Can anyone recommend some types of moss, grasses, ferns, or any other small plants that might be used with large specimens to dress up the soil a bit and give a good illusion of scale? Re: Moss and other accent plants for bonsai? That topic doesn't get much notice though and there's very little subject matter there. uh Andy........don't the british miss their soldiers?
. . . recommend some types of moss, grasses, ferns, or any other small plants that might be used with large specimens to dress up the soil a bit and give a good illusion of scale? Baby's breath (Gypsophila), rush (juncus and others), Polypodium ferns, etc. Go to a real nursery (not Home Depot and its ilk) and look at their rock garden plants. Or get a book on rock gardens and look as some of the plants used there. Many of the herbs do well as accnts in the pot or in separate pots. LOTS of weeds suddenly get a smarter cachet in an accent pot. Try wild geranium. Allium. Go to a real nursery (not Home Depot and its ilk) and look at their rock garden plants. Or get a book on rock gardens and look as some of the plants used there. Many of the herbs do well as accents in the pot or in separate pots. There is a difference between accent plants in separate pots & companion plants in the same pot. In the same pot, there is too much competition between the bonsai and the other plants. One or the other may be weakened. Even moss can be a problem. If the moss is thriving in midsummer, your bonsai is probably getting not enough sun or too much water. Many cute miniature plants, especially Juncus, like J. maximowiczii, are allelopathic, like black walnut, and could kill your tree. The most long-lasting and best behaved vascular plant I have found as an in-pot companion was blue star creeper, and that in with maples, which are strong growers. Dwarf mondo grass is also pretty safe. Stay away from Sagina subulata; it is a terrible, ineradicable weed. You will have to experiment. It is safer to put a nice companion plant in the pot just for an exhibit, & take it out when the exhibit is over. I'm not sure but that Arthur Joura's mixed plantings at the NC Arboretum haven't pretty well done away with the "competition between the bonsai and the other plants" tradition. I do it fairly often and have seen no apparent problems. The reason you're not finding much info is because most people AVOID adding these kinds of plants into their bonsai pots - except for moss and lichens. It starts to look messy and weedy fast. Different kinds of moss and lichens are great, and so are dwarf ferns, if you can find such a thing. Some of the Selaginellas are good, as are some Sedums. 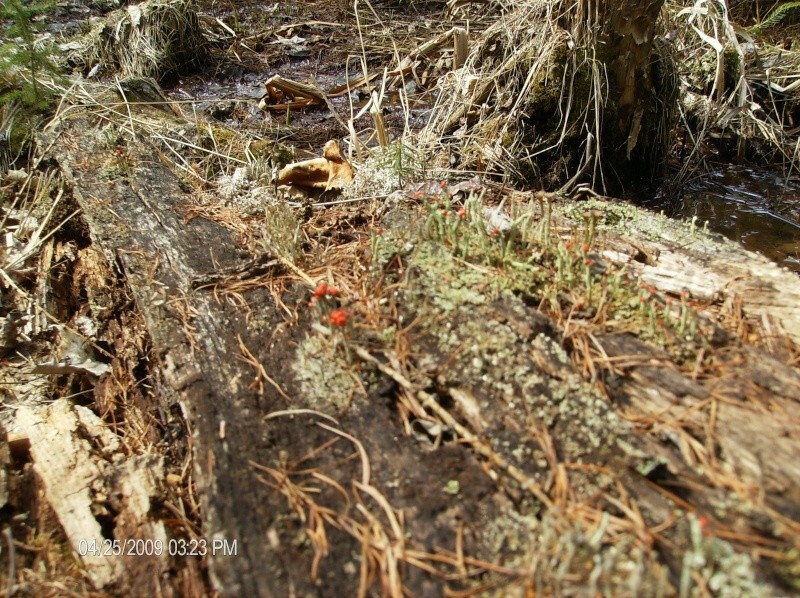 Look around for wild mosses and lichens, and little wildflowers like bluets. If it's growing around the base of a tree, or even on the edge of a parking lot in YOUR area, chances are it will work great for you. Hi, a few plants I've been using, besides good old moss for covering ground: a variety of Thyme,Thymus praecox 'Elfin', is an evergreen perennial with tiny aromatic leaves and clusters of sm. lavender flowers in summer. Irish Moss and Scotch Moss are a bit loftier and work good in small patches on bigger pieces. Selaginella, Golden Club Moss, forms a dense golden mat of soft feathery leaves. These three are moss-like, but not moss. They will get two to six inches tall if allowed, but can be manicured into tidy little bushes, also. Perhaps a reason folks avoid planting ground cover or companions is the required tending involved in keeping things looking neat and trim. I find them easier to contend with than regular moss, but you do need to keep after the snipping and clipping. Veronica, Hernieria and Cymbelaria are three perennial ground covers. The Cymbelaria has heart-shaped leaves and mauve and yellow flowers in summer. One more that makes great accents is Leptinella squalida 'Platt's Black'. It grows one to three inches tall with deeply cut fern-like, deep purple black foliage. I buy the stock plants and pre-bonsai them by planting them in low flat trays. The roots must be trimmed and trained to accommodate their use in a project. Once they're established in the flats I can cut off as much as I need or cut into long strips if I'm edging a slab. Just a small bit of the Leptinella set next to a stone gives all the appearence of a clump of ferns. Well, that's my story, and I'm stickin' to it. 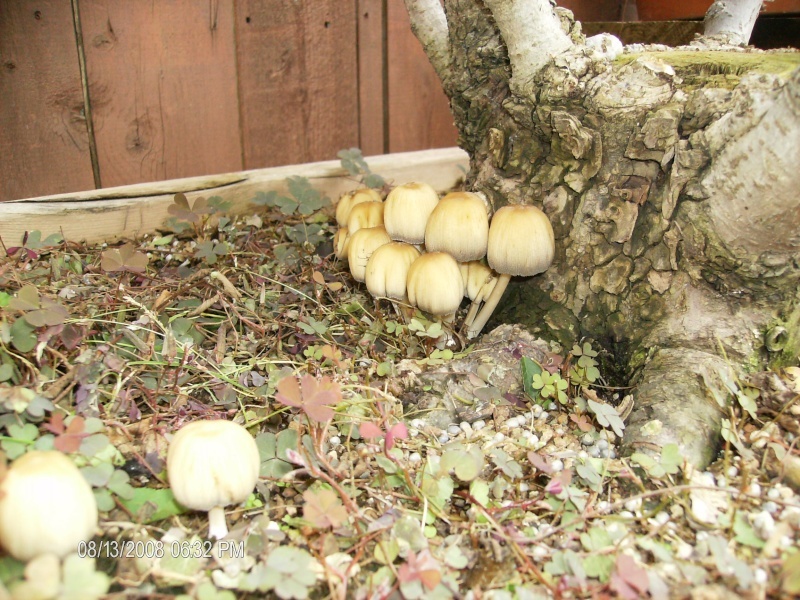 Although the mushrooms in this most may or may not be good for the tree, all most all plants need some form of fungus to help them breakdown nutrients so that the plant can use them. 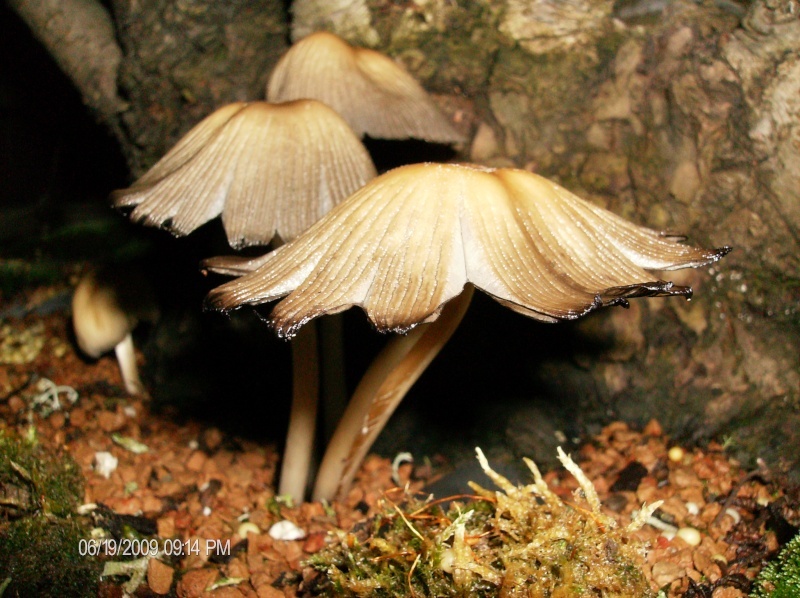 So, not all fungus is bad. 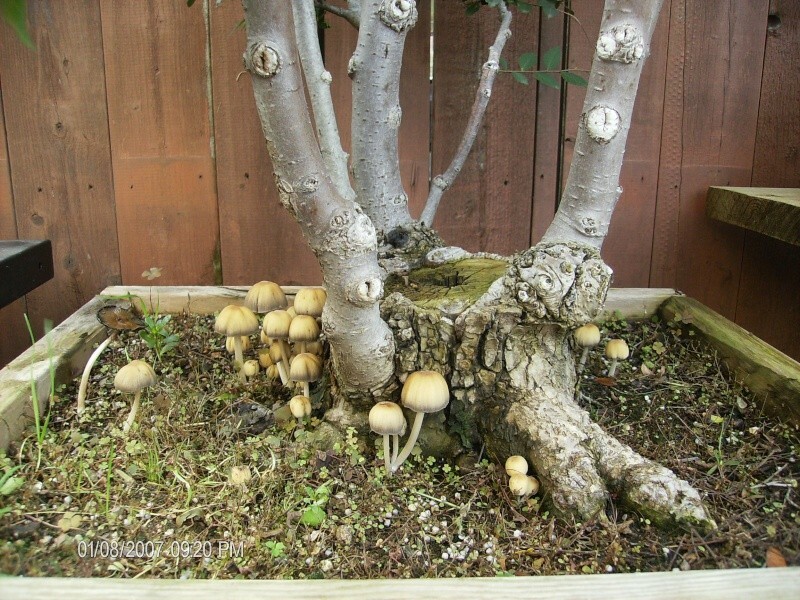 Having said this I would not encourage mushrooms or any other competition in my bonsai pots. I consider all green plants in my pots WEEDS.